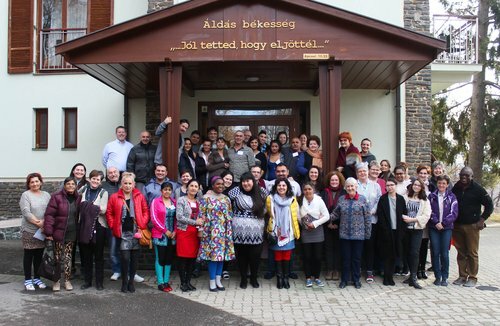 Romas and non-Romas from in and around Hungary and international guests from Greece and Macedonia participated in the seminar, Healing Hearts, Changing Nations. During the workshop, the participants had the opportunity to attend various sessions that were hosted by both local Hungarians and international speakers. 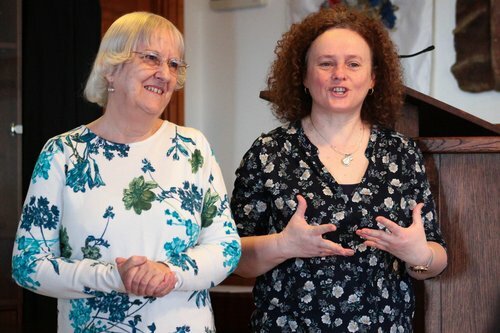 Guest speakers included Dr. Rhiannon Lloyd, a psychiatrist from Wales and founder of the workshop, Rev. George de Vuyst, a Reformed pastor serving in Transcarpathia, and Rev. Dr. Joseph Nyamutera, a pastor from Rwanda. These seminars followed the metaphor of building a house: the first day, workshops were focused on laying the foundation for reconciliation to occur, the foundation was called revelations of God. 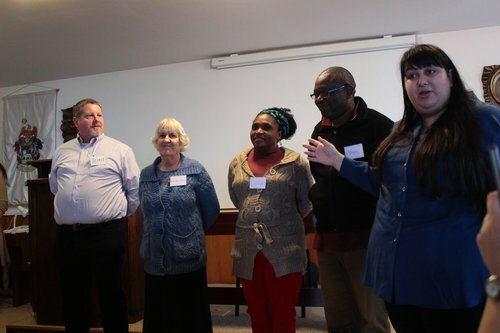 During these workshops participants were challenged to explore several topics, including identity, prejudice, relationship with God and each other, and understanding and knowing God as a loving father. The following day, the two walls of the house were built, representing the healing of hearts and wounds. In these workshops, participants were asked to explore wounds that they might have as individuals or as a nation, as well try to understand the wounded heart and its pain. The third wall of the house was built represented forgiveness and repentance. Topics of how God responds to human suffering, what it meant to forgive an offender, and what forgiveness meant were discussed. Finally, on the last day, the roof, representing reconciliation, was placed on the house. During the workshops participants were asked to participate in activities that reflected the workshop, many of these activities ended with a lot of tears and healing. There were two activities that stood out to me. The first was during a workshop on knowing God as a loving father led by Rev. Joseph. During this workshop we talked about the love of our parents or lack of, Rev. Joseph reminded us that God’s love is always shining, always unconditional, eternal, and although we do not always feel it, it is always present. During this workshop we were also asked to write down what we feel we lacked from our parents and place it in the heart of God. In addition, for those who felt they lacked the love of a mother, father or God the Father, had the opportunity to receive that love, through an activity where Rev. Joseph symbolically represented “a father,” Rev. George de Veyst “the Father,” and Rev. Eszter Dani “a mother,” and those who lacked the love of whomever had the chance to symbolically received the love by hugging the symbolical mother, father, and the Father, while words of affirmations were said to them. 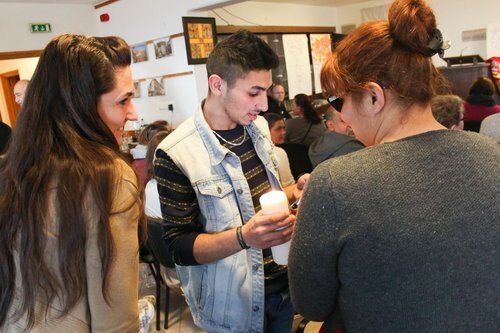 This activity was very emotional for many people because it was much needed, it was a moment to reflect and understand that God's love is always present and unconditional no matter the situation. Another activity that I found powerful was the activity on forgiveness during which we asked the Holy Spirit to guide us. Participants were asked to get into groups according to their nations: Romas, Hungarians, the West and Africa. In these groups we were asked to brainstorm whether or not our nations have wounded others, and if we had, what we can do about it. As part of the West, my group knelt down in front of the other participants and asked for forgiveness for broken promises regarding Hungary, the Treaty of Trianon and colonization, just to name a few. Other groups asked for forgiveness for looking down on each other or making fun of a certain group. 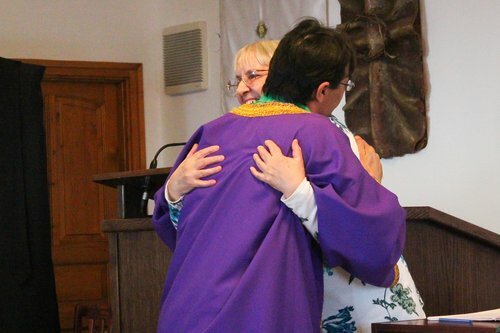 Once sins were expressed, those who felt led by the Holy Spirit offered forgiveness with a hug and kind words. At this moment, many people had the opportunity to release themselves, though there were many tears, there was even more healing and reconciliation. The workshop ended with a much needed celebration, a celebration for being part of God’s holy nation!